George gets a new home. I met a couple while waiting in the vet's office who were interested in a yellow cat and really liked George. Their big, giant Newfoundland liked George, too. We exchanged phone numbers and they called two days later. They're very nice and obviously animal lovers. They rescue Newfoundlands and horses. They have a cat who needs a feline companion. I had really gotten attached to George but, unfortunately the rest of my cats weren't too happy. I thought it was best to find him a new home before I was completely, seriously attached. George meets his feline likeness. (new garage sale purchase). George thinks I'm too involved in Zentangling! "I said- what about me?" Maybe George could zentangle...with his tail! Waking up on his last morning in this bed. On to his wonderful new home. 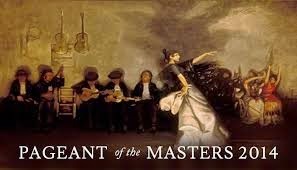 Marge arranged for us to get tickets for the wonderful Laguna Beach Pageant of the Masters. We've seen it several times, but I think this year was the very best! Marge not only got the tickets, through her sister-in-law, Karen, but drove us there, also. What a wonderful friend! We met Karen for dinner at The Lumberyard, which has become a tradition, then on to the festival. It was a wonderful afternoon and night. after seeing the art at Art A Fair. Nancy and Marge on the way to dinner at The Lumberyard. Jim Millard demonstrating how he paints. Finished version. So nice and loose! My, much tighter, version. From another angle. Peg Klinger"s painting. She's so much better at "loose" than me. A very nice beginning to her painting. The beginning of another of Jim's paintings from another class. The beginning of mine. I never seem to finish them. I'm not sure what to do when I'm not in the class. Our new favorite restaurant. We had lunch here with Helen a couple of weeks ago. The Reuben sandwiches are wonderful. It's owned and run by some sort of religious cult...but it's still good. This one is in Vista. There are others also.